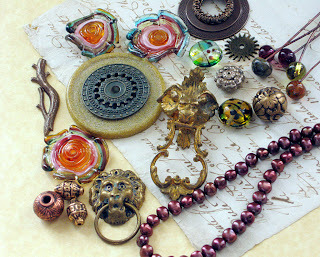 I've just completed my first Bead Soup Blog Party, hosted by the generous and super-organized Lori Anderson and for those of you who are interested in peeking behind the stage curtain to the dressing room and rehearsal hall, here is a summary of the thinking and process behind my piece. My art process is almost always about decisions-- what to include, what to leave out, what colors to choose-- but most importantly, what am I trying to say? The final decisions are always based on communication, what is it that I want to communicate? What story do I want to tell? After I received the box of goodies from my Bead Soup Blog Party partner, Lyn Foley, and fondled everything a few times, I soon set aside the fabulous, glittery ruffle flower beads as something that just had to be in the design as well as the little dabs of complex lampwork glass on the headpins she had included. The rules for the Bead Soup Party were that we had to use the focal and the clasp but anything else was up to us. My first decision was to use the headpins as centers for the flowers and group all three together on one side of the necklace. I made a sketch, the ideas flowing quickly around this initial decision and then I set it aside for the next three weeks. Woe to the designer who waits until the bitter end to finish the project! But I was overconfident that I could complete it in a few days since I had the whole thing sketched out in advance. HA! I was about to go through Plans A, B, C and D before I was done. 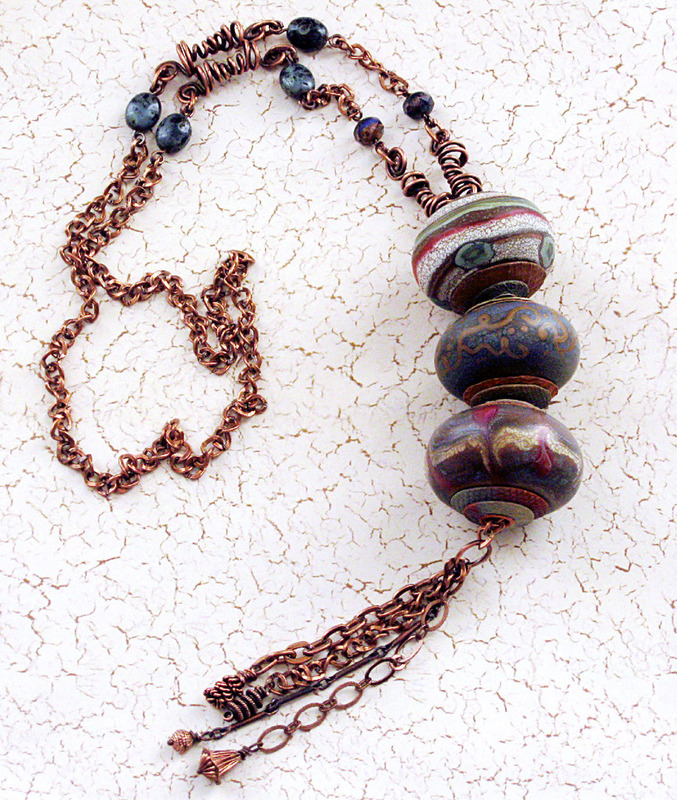 Because most of my work is in polymer clay, I wanted to showcase that medium while coordinating with the saturated colors of Lyn's beads. But no matter how I mixed and mixed again, polymer cannot reflect the light the way that glass does. I got the colors right but not the essence. 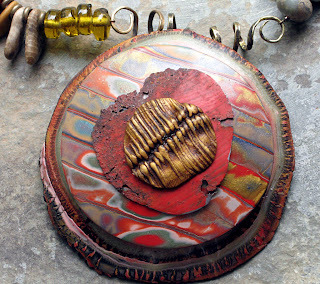 Lately my design focus has been layers, texture upon color, metal upon clay, and I wanted to do the same thing with the focal for this piece. 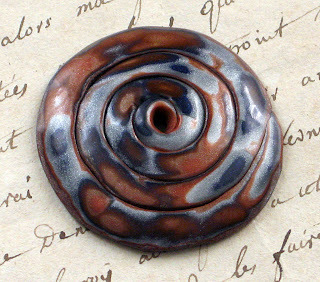 Because of the 2” size of the donut-shaped focal that Lyn sent--a piece of unknown composition (maybe bakelite?) --I couldn't make the polymer disk backing it too large. 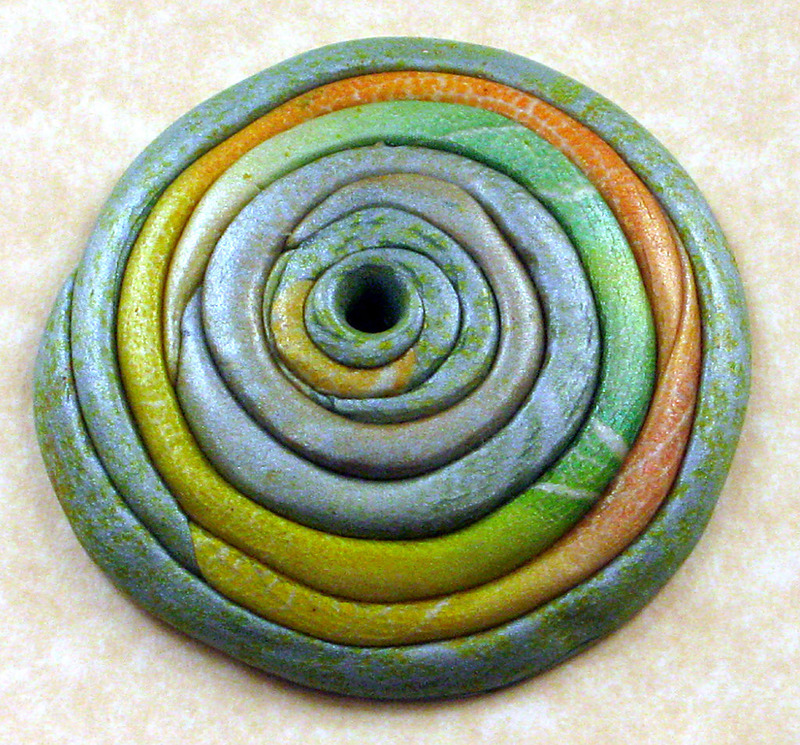 Perhaps I could circumvent the color reflection/compatibility problem if I used a very fractured pattern in the clay? 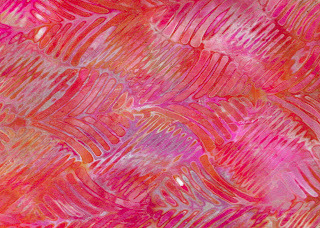 I was planning to do it in a version of mokume gane, a technique borrowed from Japanese metalworking, where layers of colors are stamped with a texture sheet and then shaved with a clay blade to reveal the pattern. 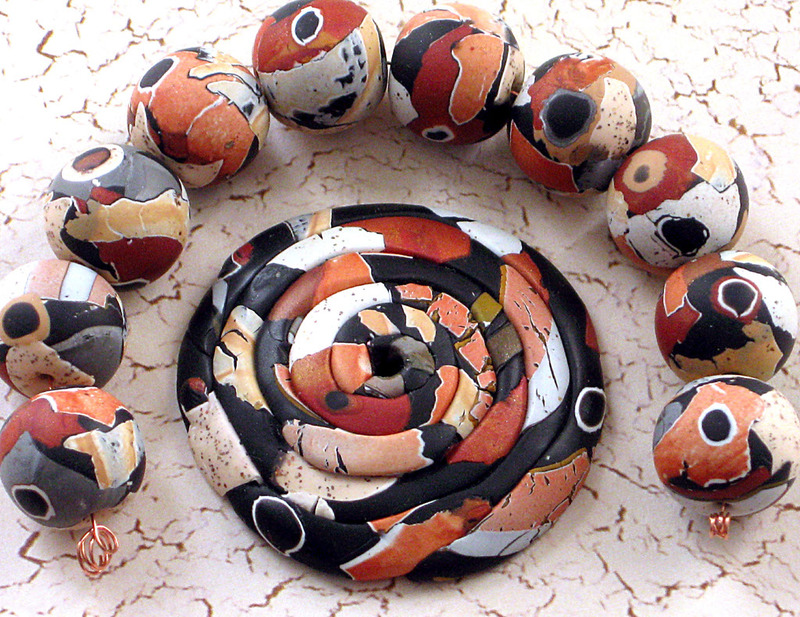 Another decision came into play here--a little design trick to fool the eye into accepting the flatter color of the clay was to cut the background into a shape similar to the twisted ruffles on the lampwork beads. I doodled some shapes and arranged them around a circle I had drawn to the size of the donut focal. I laid it on the patterned clay mokume gane veneer and with my super-sharp scalpel, I cut around the outline. I laid the finished disk on a domed form, cured, sanded and polished it with a custom-made Dremel buffer and it was ready to combine with the focal. With the leftover mokume gane veneer, I made a set of six beads, thinking to march them up the left side of the necklace, separated with small lampwork spacers I had in my stash. These were completed and cured and sanded and polished and I temporarily strung them with some stamped metal beads from Lyn. Whew! At least one element was going off without a hitch. I had already planned to use some very unusual kinked vintage brass chain from Cool Tools as my stringing medium and add the provided chocolate/burgundy pearls as a second strand alongside it. Then it happened. You know how when you're designing, something just expands in your brain and suddenly you know where you're going? An “ah-ha” moment, when you realize that the thing you're creating has just taken the reins away from you and you're happy about it? I call this “listening to the Muse” because I know that I am now thinking from some very deep part of my unconscious and that is what is now making the design decisions. I feel very lucky when this happens because I know then that the piece will be a communication of who I am to those who look at it. It will reflect my style, my ideas, my personality, what my influences are, what I've been reading/watching/thinking. So since I've been obsessed with wirework and the HBO series “The Tudors” lately, the weird chain and the significant focal made me think of the ceremonial chains of office that the nobility wore in Tudor England. Suddenly I imagined some open wirework “petals” surrounding the polymer disk that would link the ruffled petals of the lampwork beads to the pattern in the polymer. It would enlarge the focal but keep it airy and visually light so the size wouldn't be a problem. At least not in my design world (or that of Henry VIII). I sketched out the wirework petals and then used my neglected Wig Jig to build them. I embedded them in clay and placed another pad of clay on top and cured the whole sandwich. Lyn had included two antique lion drawer pulls in my package and either one could have been used for my clasp or focal. 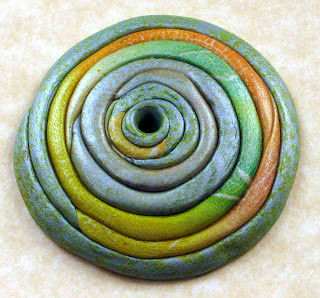 One I had initially thought to screw to the focal donut and just add the polymer disk as a color backing. 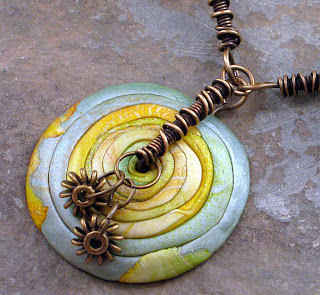 Then I started stacking the focal --lion pendant screwed to donut focal, polymer disk, wirework petals. 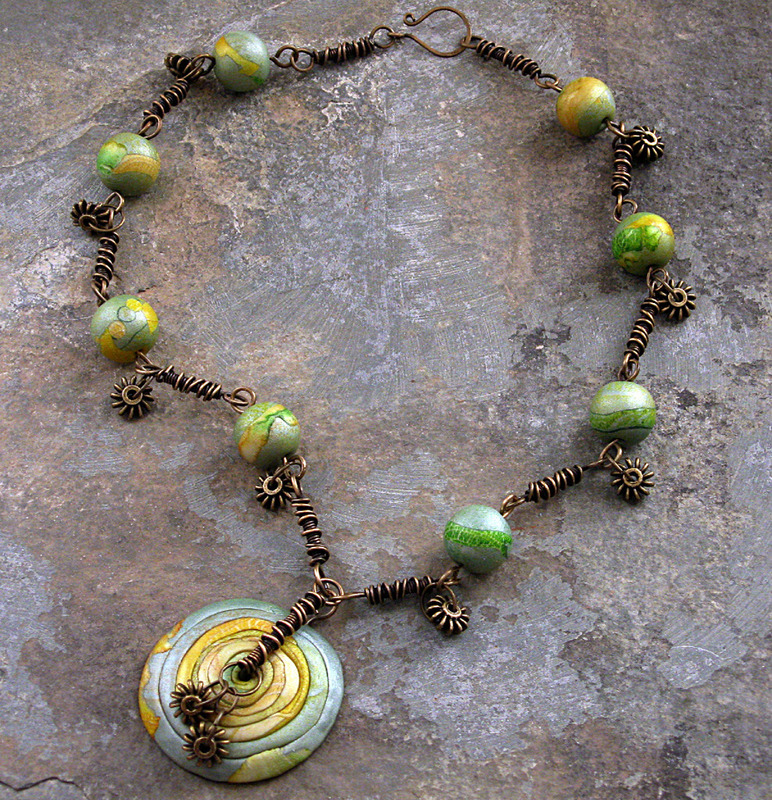 Since I now had attachment points for my chains, pearls and beads to the wirework, I didn't need to build any into the clay. Ah, the end is in sight! 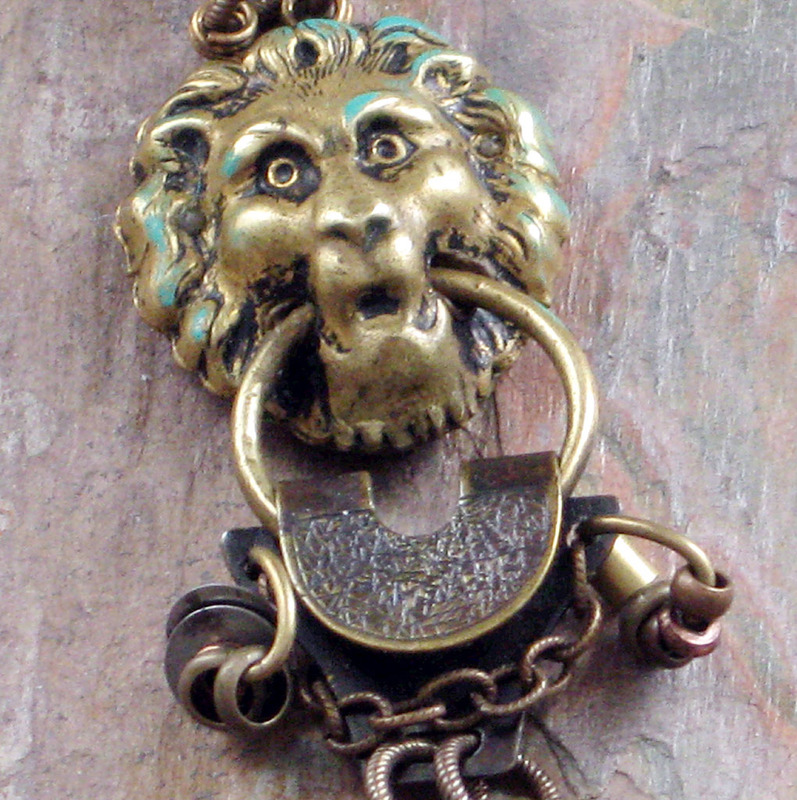 The clasp came together quickly once I realized that the lion head had to be balanced with something of equal visual weight. First I made a hook of wire strung through an antique metal bead but it was too thin and left a hole in visual look of the necklace. So I went rummaging through my found object stash and there was an old hook from a pair of denim coveralls I found at a local yard sale. 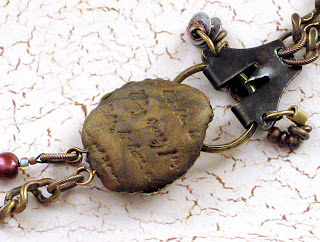 I hung the side holes with jumprings strung with old watch parts and tiny metal spacers and draped a chain across the front. 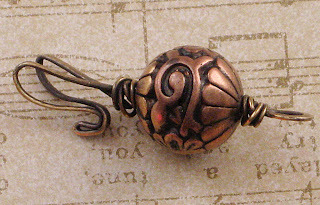 The lion drawer pull stamping was very easy to finish off -- filled with polymer clay, it held two wrapped wire loops that acted as connectors and then the piece was cured. 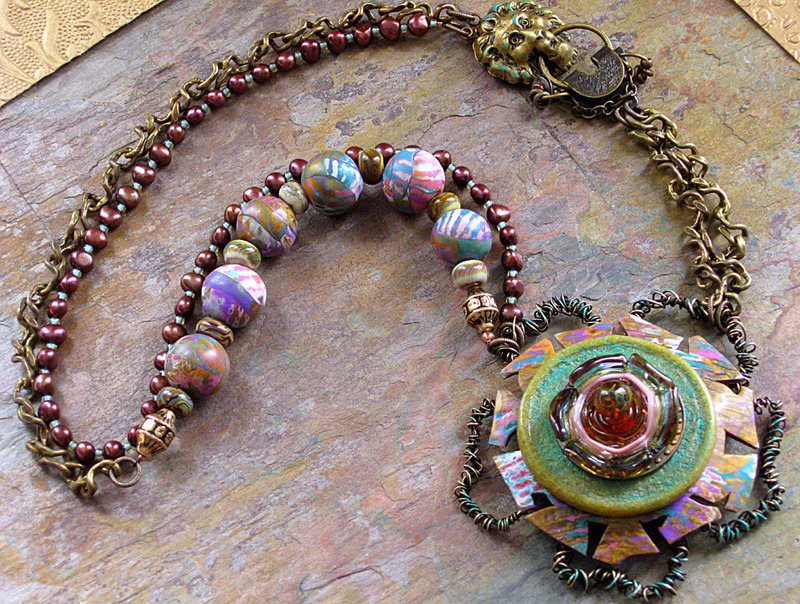 If I had had more time, I would have completed it by antiquing the texture and maybe applying some guilders paste. I hated it! I thought about what Tory Hughes says, “don't judge a piece until you've finished it, polished it and it's completely done”. Well, it was completely done and a nightmare. Too much of everything, a joke. I was ready to throw in the towel. I'd been working on it steadily since 6:30 a.m. and my brain and coordination were fried. But I still had to shoot a photo and blog about it and the Big Reveal was the next morning. So I tried to think of what I did like about it, what absolutely had to be there and what I could take away and still keep the essence of my vision, of what I wanted to communicate. The flowers, that's what, those wonderful, glimmering glass flowers! The color elements around which I was building the whole piece-- they had to go! I took them off and the visual balance in the piece was re-established-- it was that simple. 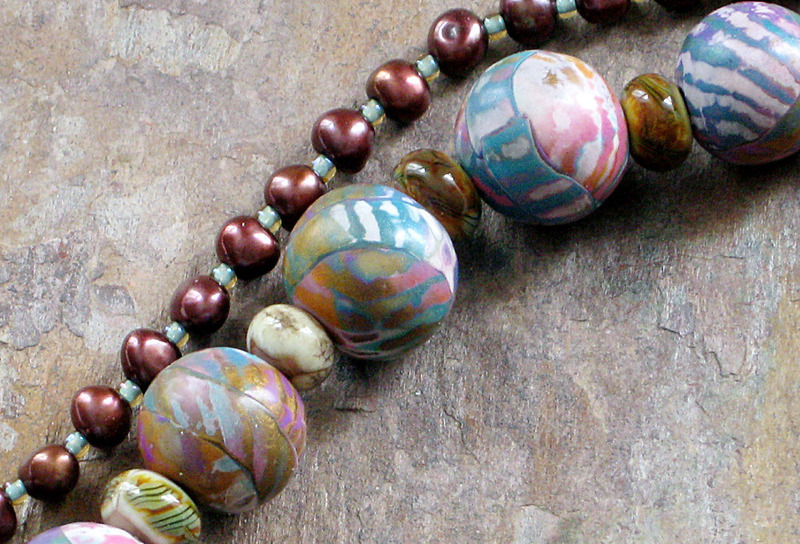 But I wanted to showcase those flower beads! 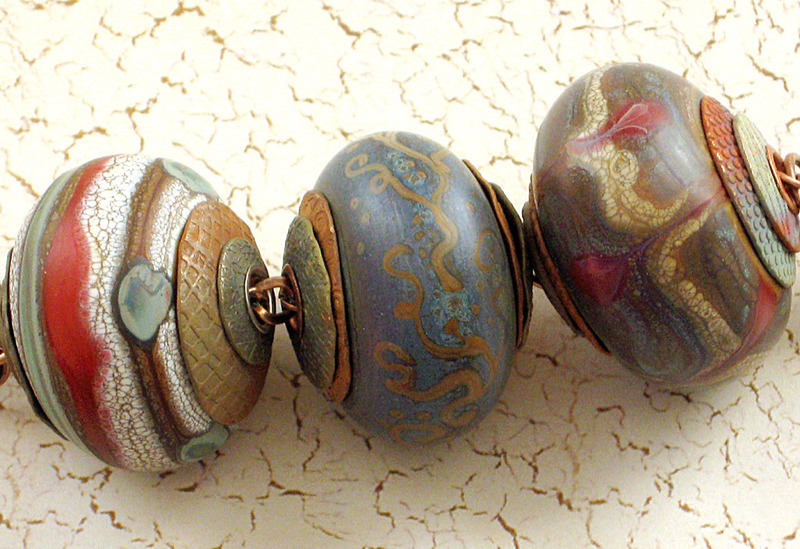 I had already chucked the idea of the other drawer pull for the center element in favor of one of Lyn's lampwork rounds, which was just the right size and color for the center of the focal. 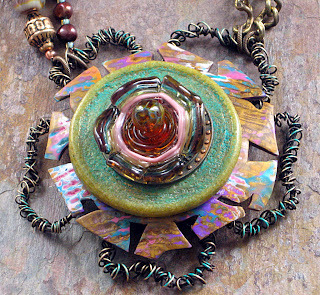 Well, if that could work, then I knew I could just swap in a ruffled bead with a headpin at the center and it would be perfect! I applied some guilders paste in a patina color to the donut to make it blend better with the colors. I won't bore you with the details of my struggle to re-stack the whole thing back together but I did have to do it a few times before it was right. So what did I learn? I've said this before and it bears saying again-- good design takes time. It takes patience, vision, and the courage to make decisions. The rewards are great and mostly very private-- some will love what you've made, some-- not so much. But your reward is that it's all yours-- an expression of your head, hands and heart. Go play! Thanks for reading.